On a tip from a tweet this morning (/ht: @lmclaughlin) and a review of Jibbigo’s iPhone app from CIO magazine (here) I decided to purchase the application in advance of my trip to Japan later this month. Jibbigo is not a dictionary and not a phrase book, but a speech translator: You simply speak a sentence, and it speaks the sentence aloud in the other language, much like a personal human interpreter would. Jibbigo also shows the recognition and translation on the app screen, so you can be sure your translation is accurate to what you spoke. Best of all, Jibbigo runs completely on your iPhone and does not connect to remote servers via data-communication links. There are no connection delays, no roaming charges and no disconnects! That means your pocket interpreter does not disappear on you during foreign travel when you need it the most. There were a lot of negative reviews of the previous versions of the application but frankly while the dictation part is great, I also don’t mind having to type in a phrase, either. The way I look at it is if this thing gets me to the right hotel in a Taxi once, it’s paid for itself already. A more real-world review is pending my travel to Tokyo. It’s $27 and available from iTunes here. If it works I’ll consider the Chinese version also, as I have a trip to Beijing quickly approaching. If you are traveling to Germany anytime soon please check out SpeechTrans.com its The worlds most accurate Speech Translator with over 5 times larger vocabulary than Jibbigo, and facebook and twitter integration. Plus it is powered by nuance so there is 90% voice recognition accuracy! It will be in the App store next month. Also jibbigo only works on the 3GS bi-directionally, Speechtrans will work on ALL iphones! What about these shpeshal hobbitshoes? I’m interested to hear how this works out. Most Japanese / English translators are designed for Japanese speakers and often aren’t great for english speakers. In this case the interface at least seems to be fine for an english speaker which means you are already ahead of the game in the land of Japanese translators. Thanks for the review! I hope you enjoy Jibbigo during your travels in Tokyo; I see lots of taxis bringing you to the correct hotel in your future. 🙂 If you have any questions or concerns, feel free to contact us at info@jibbigo.com. 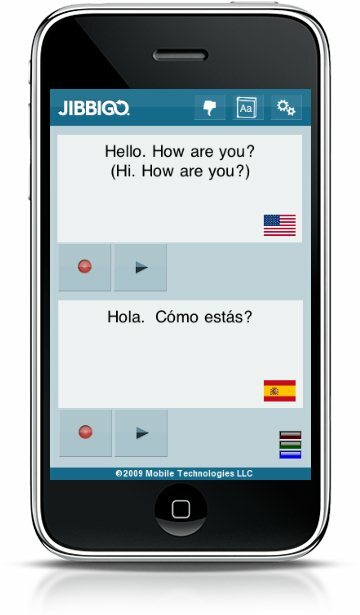 I’m planning a trip overseas, so I downloaded the free app from SpeechTrans (after reading the comment above), and it definitely wasn’t as “advertised.” When I practiced using it, it didn’t recognize my friend’s voice (a native Spanish-speaker), and only after I read the fine print did I finally notice that it says “texting ability to translate from Spanish.” So I guess it’s okay as long as you don’t expect people to actually talk to you in a foreign country. Oh, and I quickly ran through the free 10 uses, and then was told that I’d need to pay five or ten bucks to keep using it. Nice. 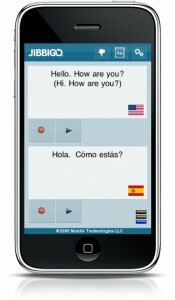 So I took a leap of faith and bought Jibbigo’s Spanish translation app instead, and guess what, it actually works…. I guess you get what you pay for.